The fall season is approaching and it’s always the perfect time for me bake up desserts that are best served warm. It’s just something about the cozening up on the sofa with a warm slice of cake or pie, or sometimes even a bowl of cobbler. 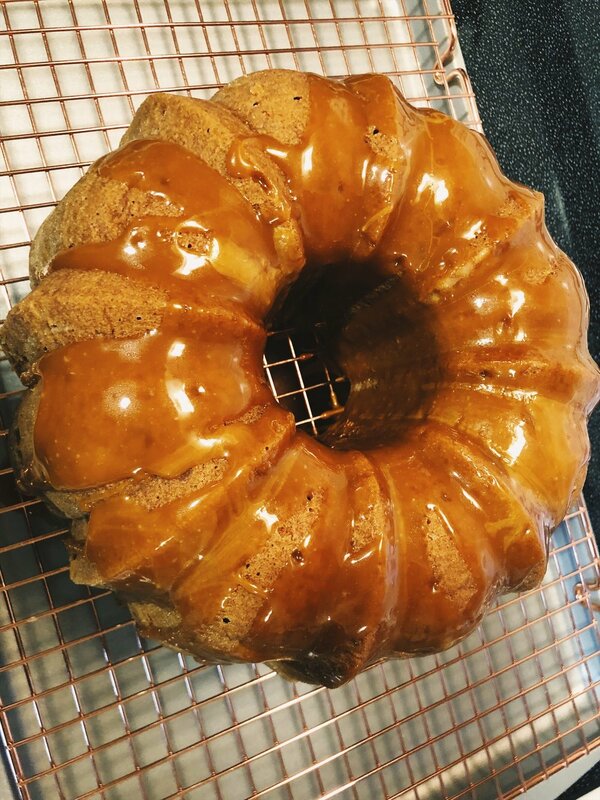 I must say a freshly made Apple Cake is always on my must-bake list when the temps drop and leaves prepare to change colors. For those of us in North Texas, we usually have to wait until October for these things to happen. *If the apples are large, you may need about 2. If they are medium in size, approximately 3-4 apples. Sift dry ingredients together. This will be your flour, salt, baking soda, and cinnamon. For a slightly lighter cake, you can sift the dry ingredients one additional time. In an electric mixer bowl, cream sugar, oil, and vanilla until smooth. Gradually spoon in the dry ingredients while alternating with the orange juice. Batter will slightly stiff. Add in eggs, one at time, being sure to mix thoroughly after each egg. Stir in walnuts and apples, until blended. Pour the batter into the prepared bundt pan. Bake for 1 hour and 30 minutes. To ensure cake is done, use a cake tester or toothpick to stick in the cake. The tester/toothpick should come out clean. Remove the cake from oven and let cool in the bundt pan for 7 minutes before turning out onto cake plate. Allow cake to cool on cooling rack for an additional 15 minutes. In a large saucepan, combine all ingredients and stir until mixed well. Place the sauce pan on the stove, and cook on medium heat. Bring mixture to a boil. Allow to boil for 5 to 10 minutes (depending on the heat setting), until it thickens slightly and begins to turn light brown. Remove pan from heat and set aside. Using a toothpick, punch no more than 20 holes into the top of the cake. Pour the glaze over the cake. Allow cake to set and cool before serving. Store the cake in an airtight cake container in the refrigerator for up to 7 days. This Apple Cake goes deliciously well with a cup of coffee for those mornings after a holiday.